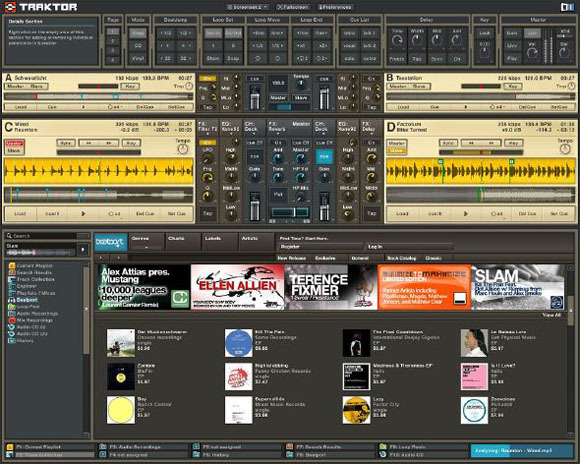 Four Decks, Four Channels: You’ve now got four mixable sources, complete with Traktor’s usual view/loop/cue editing; use the extra two to add additional loops, beats, samples, whatever. Hardware emulation: Analog modeling reproduces the crossfader, mixer, EQ, and filter of the Allen & Heath Xone:92. The gang at the ultra-pro DJ gear maker even collaborated. There’s also swichable support for the Ecler Nuo4 and Pioneer DJM-600. In other words: your computer can be pretend to be pricey hardware. beat masher, flanger, delay and reverb can all be synced. Beatport music store integration: For some truly braindead reason, the folks at Apple and Microsoft (and presumably the major music labels) don’t license your online store purchase for DJing in Traktor, but the superb Beatport has stepped up to the plate. You’ll be able to buy directly from their store inside Traktor — though it doesn’t quite have the same feel as ruffling through stacks of vinyl, does it? Overall, an amazing bargain, and a huge upgrade. Now the major music labels need to get their act together and start selling to digital DJs. Tired: Using iTunes on your home stereo at your next dinner party. Wired: Using Traktor DJ on your home stereo at your next dinner party.